The perfect homemade gift for your friend obsessed with unicorn stuff! Kawaii Unicorn Mason Jar Craft Step 1: Paint! Begin by painting the entire outside of the mason jar white. Let it dry and paint another coat. Repeat until full coverage is reached. Next, paint over all the white paint with the Dishwasher Safe Mod Podge. This will keep the paint in tact even through watering the plant. Kawaii Unicorn Mason Jar Craft Step 2: Paint the face! After the Mod Podge is dry, add a half circle closed eye in black (refer to pattern for example). Place it about 1/3rd way down the jar. 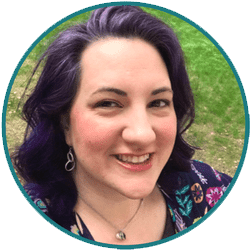 Add 3 lashes, then place another eye, swooping in the opposite direction about 1.5 inches away (depending on the size of the jar). Paint little pink circles under each eye. Let all the paint dry. Then coat the mason jar with one more layer of Mod Podge. Kawaii Unicorn Mason Jar Craft Step 3: Cut the Felt! 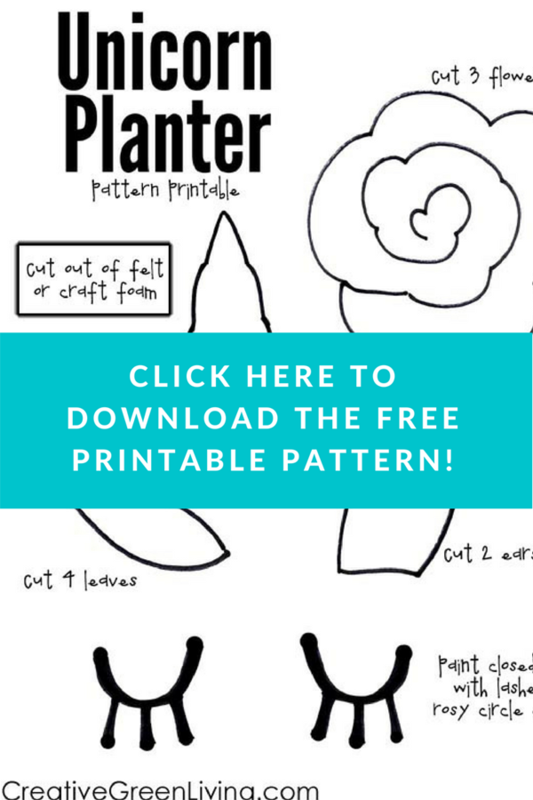 Cut out white ears, green leaves, and pink/blue spiral flowers out of felt and a gold glitter horn out of foam using the FREE printable unicorn horn and crown pattern. Begin with the outside edge of the spiral. Use hot glue along the inside edge and roll the felt up. Add a dab of glue to the rolled up center and press it down on the circle base of felt remaining. A darling little rosette! Repeat for the other colors of felt cut. 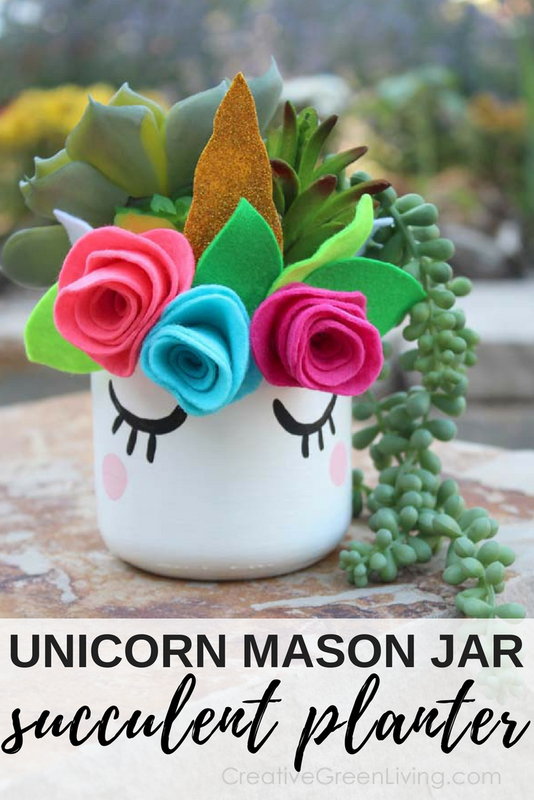 Kawaii Unicorn Mason Jar Craft Step 5: Add the Magic! Hot glue the leaves to the roses. Hot glue the unicorn horn on the center of the maso jar. Hot glue the ears on the sides of the jar. Hot glue the roses on the top like a crown. Now add pebbles, soil and succulents if taking the live plant route. 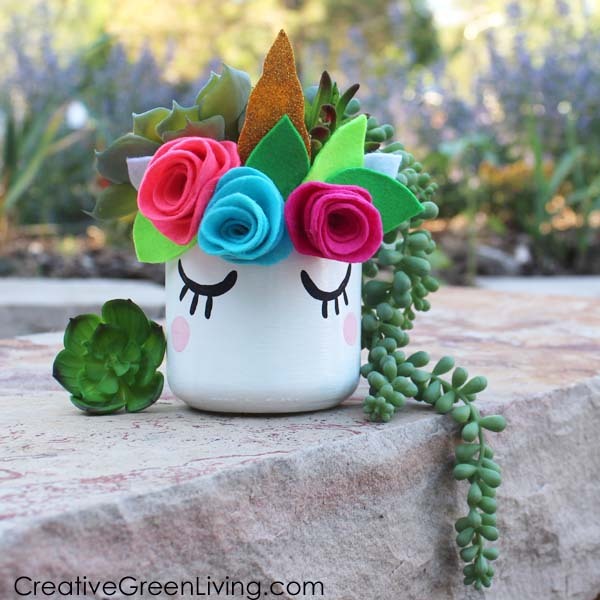 If using faux succulents like me, stuff a styrofoam ball inside the jar and stick the succulent picks inside. I love the string of pearls! It looks like a majestic unicorn mane! Can you believe this unicorn mason jar used to be a jar from my pantry destined for the recycling bin? I love how adorable it turned out! Now all the glass jars need to become unicorns!